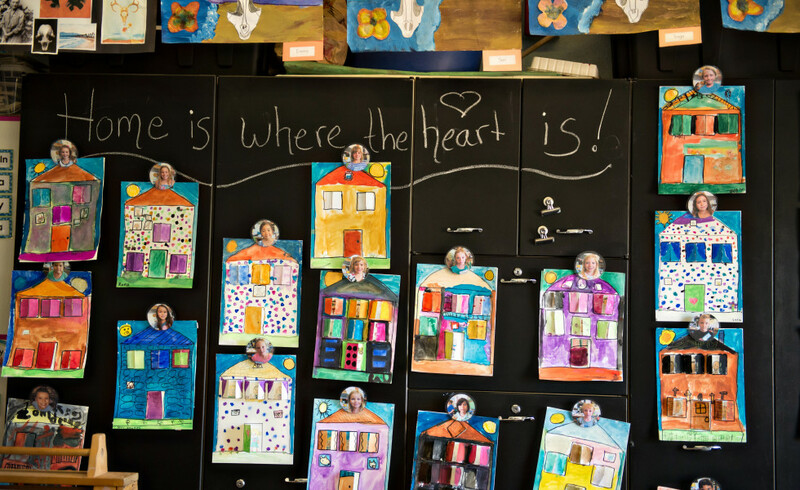 Santa Barbara Charter School nurtures lifelong learners by cultivating the interests and building the skills of both students and their families in the arts, academics, and relationships. Visual and Performing Arts are used to deepen and enrich instruction across the disciplines. Art is also taught as a multi-cultural, substantive discipline in its own right; this approach allows students to develop critical thinking, problem solving, and communication skills, as well as exercise their creativity. Art is also taught as a methodology to enrich instruction across the curriculum. Learning through the arts is seen as fundamental to success in every other discipline. Classroom teachers or specialists often integrate visual arts, fiber arts, crafts, music, creative movement, dance, and drama into the daily program. It is understood that artists bring an intensity and focus to their own field which is uniquely inspiring to children, so specialists are an important part of our program. Students are exposed to specialists in both visual and performing arts throughout their education at Santa Barbara Charter School. The exploration process is as important as creating products. While artistic exploration often results in performances and or projects, students are encouraged to embrace the challenges of the creative process for its own sake. A selection of arts-based electives also may be offered each semester in the middle school grades. Students are introduced to great artists and works of art throughout their educational career. The on-site arts program is supplemented by many trips into the community to see performances and exhibits. Students are taught to be an astute and appreciative audience as part of their ongoing educational experience; these skills are usefully applied on field trips. Attending these performances and visiting exhibits helps develop a deep sense of appreciation of the arts by facilitating the development of both experience and aesthetics. Beginning in kindergarten, students participate in an articulated fiber arts program and final exhibition. Students perform in an annual class or school play. Students enthusiastically anticipate these activities and demonstrate remarkable creativity and talent in both areas.